This photo turns out to be almost as many fireworks as I saw on the 4th, as we decided to take a risk and see what what could be seen of the city firework display from the backyard of my niece and her husband’s new house. It turns out you can see them mostly through trees. Someone commented that it looked like Christmas. This display followed a session with a potato gun and preceded some possibly illegal fireworks in the back field. In case you aren’t familiar with the common potato gun, it is used to shoot raw potatoes a great distance.This is normally done in a large field behind the house, but this time the men decided it would be a good idea to attempt to shoot over two houses separated by a street, into a pool. Although they were unsuccessful landing a potato in the pool, they managed some potato shrapnel on a roof. 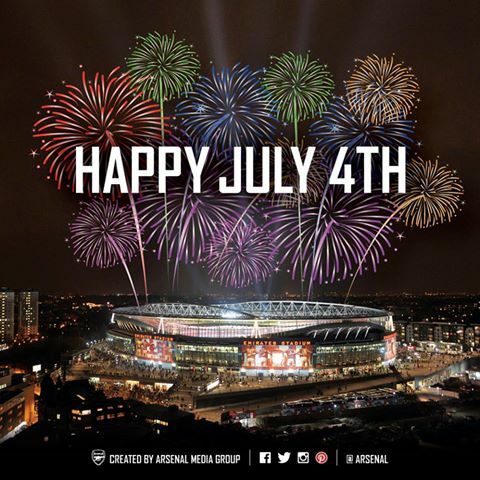 So a good 4th, all in all. In quasi-Arsenal news, how about Alexi Sanchez putting in the winning penalty to beat Argentina in the Copa America and give Chile its first major national team win last night? What an amazing guy. Congratulations to Chile and to Alexis. Alexis, please rest and come back free of injury and ready to win some more. Now, about the cold feet. Over the weekend, I was beset by massive insomnia. My insomnia is usually due to using night time hours to fret over every small thing–an email I got, a thing I need to remember to do, something I should have said (or not said, more typically)–and every large thing. This weekend what was on my mind was how I’m really going to manage to do this thing, this going to many Arsenal games over the season. How to keep in touch at home. How much it will cost. Where to stay. How much work I’ll miss. Logistics overall. This is on my mind, no doubt, because the draw for games we’ll get to see will occur this week between the other folks who share the tickets. Until that happens, no planning can be done. And after that happens, much planning must be done. So the work of the next few days must be to rank the games, understand kids’ school schedules and other schedules, to be prepared for the draw. I hope I’ll be able to sleep after it’s over. But then I’ll probably need to stay awake mentally making my shopping list, or wondering why there are no months that begin with Z.
I received a gift from my brother’s family while in Kentucky, displayed to the left. My niece loves playing soccer and was instrumental in helping my sister-in-law select the right team ball after reading my blog. 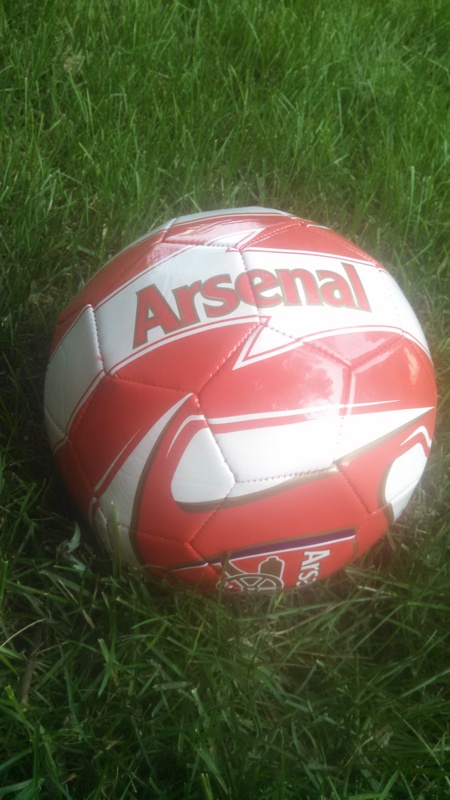 It seems only right that we find some way for the ball to be part of our Arsenal adventure. The ball needs a name, I feel. Please submit your ideas. Congratulations to the U.S. Women’s National Team who won the World Cup as I was working on my post. What an amazing time to have the best game of the tournament! No cold feet whatsoever, just cold blood.